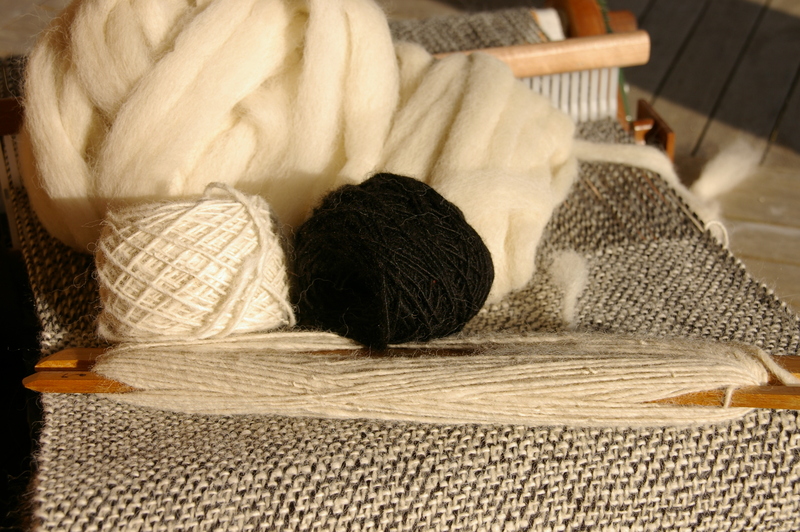 This black and white palette gives me an excuse to use my alpaca hand spun yarn for the weaving. 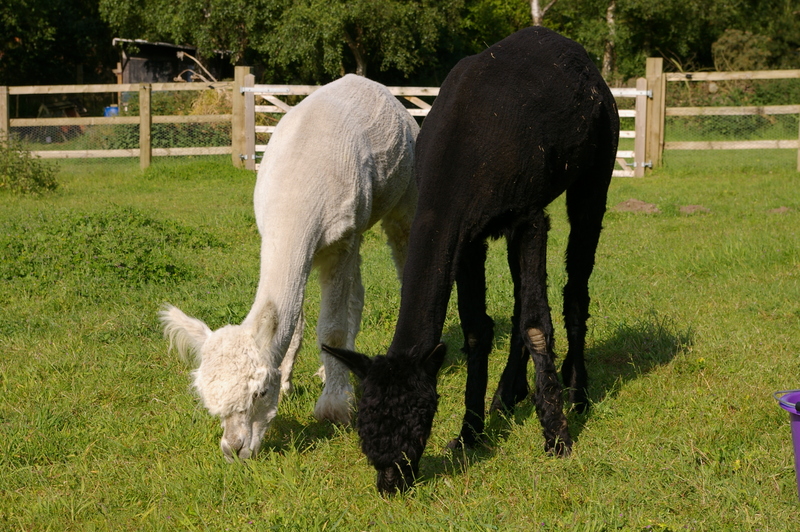 These are two of my three alpacas, Tequila is the white one and Pepsi the black. They are over ten years old now and been together since they were born. They are sheared once a year in May by a lovely girl who has known them all their lives so they are very relaxed with her. I have the fleece processed by Norweft Alpacas in Wales where they turn it into sliver ready for me to spin and dye. 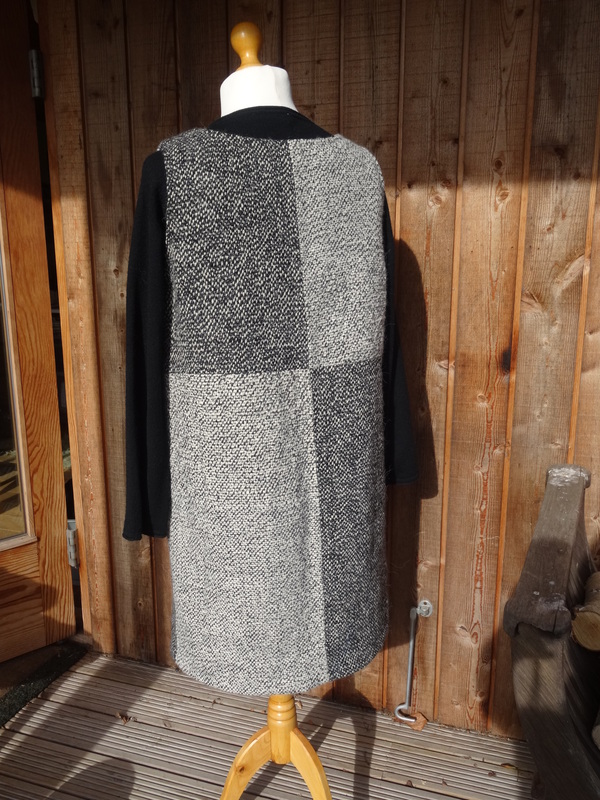 They have own flock of alpacas and make beautiful items from their fibre so they are very sympathetic to the handling of the fleece. I use to do the whole process myself but over the years I found I could not keep up with the shearing so now take this short cut to the finished yarn! 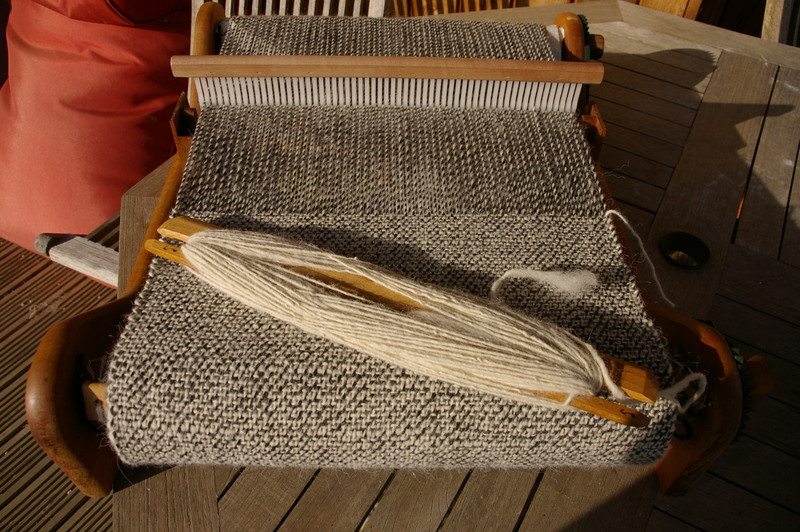 I wove the fabric on a 16″ (41cm) rigid heddle using a 7.5 reed and a commercial black and white wool and alpaca warp. I had spun a soft, fairly thick singles for the weft which I weighted after I had washed the skeins to try to eliminate any extra twist that I may have added. I wove half the warp with a white singles and half with the black. 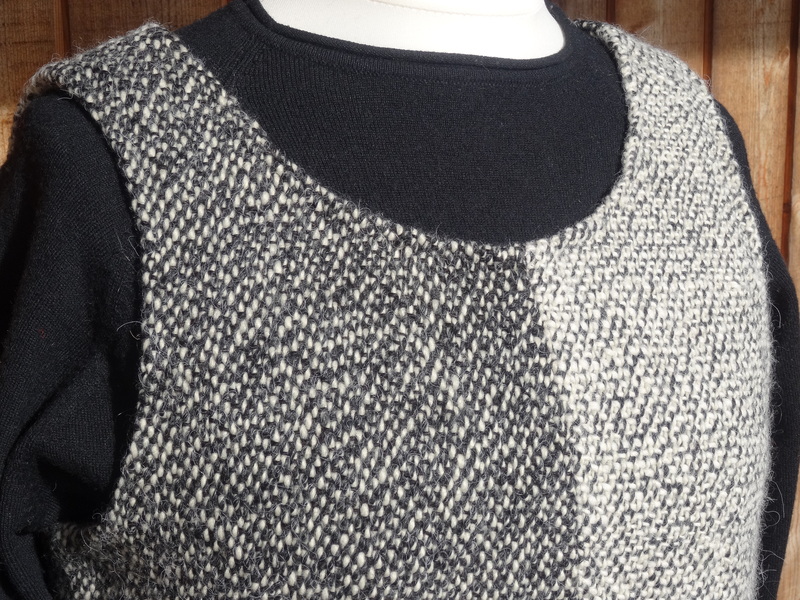 Using a simple pinafore pattern which I had cut in half just above the waist, I added extra turnings to the pattern before I cut out one back and front in the black fabric and the same in the white fabric. 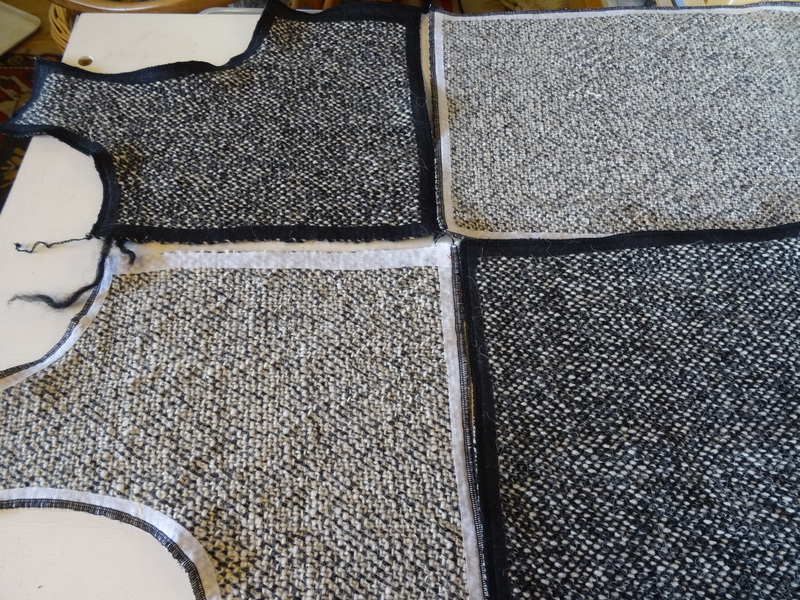 I used the woven iron-on interfacing in both black and white to secure the edges before over-locking all of the cut edges. 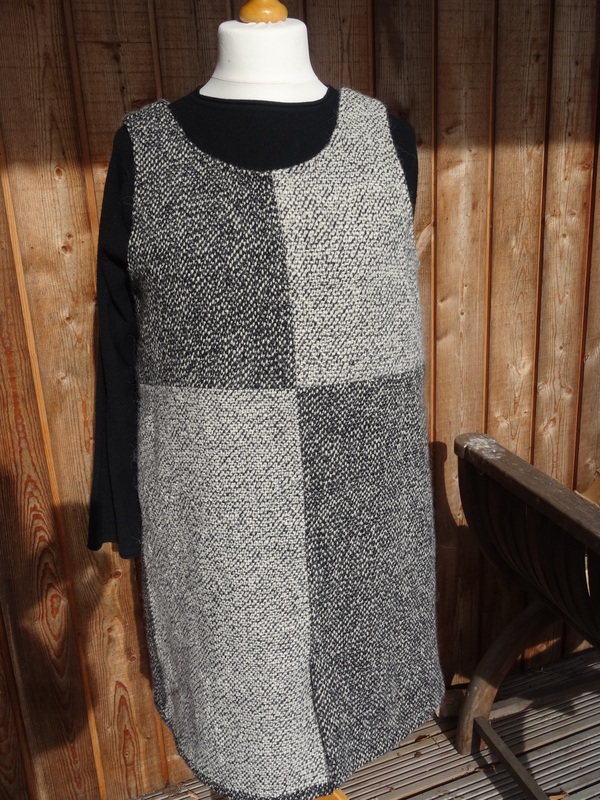 This is a lovely easy pattern to make up, with no fastenings. It is fully lined so slips smoothly over your head and is comfy to wear. Always remember to wash the fabric before you start sewing as it does allow the yarns and fibres to come together and gives far more drape and flexibility to the fabric. The woven iron-on interfacing will secure even the most loosely woven fabrics and make sewing so much easier.